Some of our upcoming programs are highlighted below. You can view our entire program offering by viewing the Spring Activities Guide. 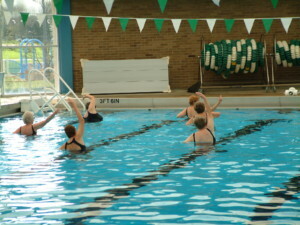 We offer daily drop in and registered water fitness classes on a year round basis. In addition to specialized registered programs, our drop-in water fitness classes are deep water workout and shallow water workout. This is a basic deep-water class. Benefits include no impact, improved flexibility, improved muscle strength and cardiovascular fitness. Belts, hand buoys and noodles are provided. 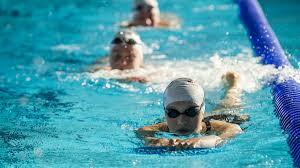 This class consists of aerobic routines, stretching and toning performed in chest to shoulder deep water. Not only is this class fun and much less likely to cause injury, the natural buoyancy of the water makes even a beginner feel graceful and competent. The resistance from the water gives you a first-rate workout. No swimming skills necessary. Fitness comes in many forms for different people. Not everyone is a traditional lap swimmer. 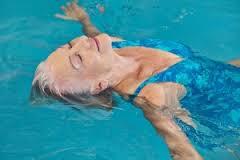 Some prefer to use an aqua jogging belt and attain their fitness goals or rehab in the form of aqua jogging/walking. We encourage aqua jogging/walking during our normal lap swim times. We ask that "fit swimmers" please share lanes as needed and go in the direction of the lanes rather than across the lanes. 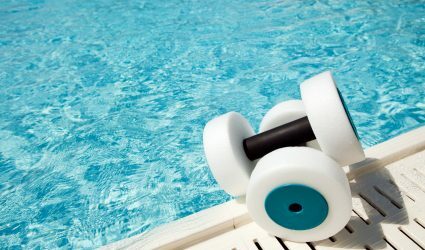 Aqua jogging is also permitted in the shallow or deep end, if the opposite end of the pool is ONLY being used for a water workout class.